Already own the DVD Integrative Massage Spirit? Call us at 1-800-364-5722, 9am to 5pm, to discuss your enrollment options. The Spirit Massage is a gentle stress relieving massage designed to quiet the mind and get the client in touch with own inner healing rhythms. This course integrates Lymphatic Drainage, Guided Imagery, Energy Balancing, Myofascial Release and Swedish Massage. Benefits include stress relief, deep relaxation, and increased mental, emotional and spiritual clarity. Perform this routine on receivers who are stressed, scattered, or in emotional turmoil. Gentle, energy-based techniques, coupled with guided imagery, induce a meditative state where excessive mental 'noise' is quieted and a sense of inner balance and harmony is attained. This video also includes a 5 minute Kundalini Yoga routine for the practitioner. I really enjoyed the course. I am currently practicing at a rehabilitation center for mentally ill residents. I found the course to be very helpful in my particular practice. The residents responded well to the techniques used, and overall achieved a sense of well-being. Great course!! This course met all my expectations and will be useful in my practice. I can't wait to take another in this series! The information was clear and to the point. The video was easy to follow in my practice sessions. The DVD is amazing. The reading was very straight forward. THANK YOU!!! I actually watched the video first. It allowed me to see how detailed and thorough the spirit massage is (which I like). I then read through the course material. I printed the test and then went back through the text while answering the questions. I passed the test but now I am actually going to practice the spirit massage on family (husband and kids) until I feel comfortable integrating the spirit massage into my practice. Thank you for providing such a thorough piece of work! Very in-depth class. I enjoyed the video and the workbook was full of good information. Some of it was a review and some of it was new. I will definitely take the other integrative massage classes that go with this one! Very pertinent content. Video is extremely helpful. I enjoyed reading this course and viewing the dvd included. Thank you. Very enlightening. I know my clients will highly benifit from this new and refreshed knowledge. Thank you. I thought the course was well laid out and easy to follow. It was very thorough in explaining each of the facets of the Spirit massage. One of the best courses that I have taken so far. I hope that you also provide the other two courses: Fire and Earth Massage. Fabulous. Nicely done, i will be ordering again. Thank you. I really enjoyed the material and video. I will be able to use this info in my practice. It was a nice refresher for some of the content. Love this course and can't wait to take the other two - Fire and Earth. Thank you so much. Your online courses and videos are just amazing! And gives me the time and affordability to go forward in my studies. This course was very interesting and informative. I will use this site again to gain more knowlegde and CEU's. Thank You! Love having DVD's to show presentations. My clients have found this massage very relaxing. I enjoyed this course very much!! This course has inspired me to go more in depth in Lymphatic Drainage training. I like learning new ways to use the massage techniques I already have learned. Awesome course! A great refresher for me - thank you! Definitely enjoyed this course... although I admit that staying awake during the videos was a very difficult challenge! That said, she was very easy to follow what she was doing, and her descriptions were clear and she was very pleasant to listen to. I really liked that she used a number of techniques that I already incorporate into my massage work. I will definitely use this lovely routine in my practice! This was a good refresher course for me overall. I did learn a few new things about Myofacial and Lymphatic work that I will incorporate in my routine. The reading material was clear and to the point. It was actually relaxing to read through and do the questions. This Spirit course was by far my favorite, which is saying something because I have enjoyed all of the classes that I have taken with the Institute. Totally enjoyed the materials and video. Found the mix of techniques interesting and insightful. Did find draping technique on leg to be less conservative than I am accustomed to. Diaper draping was the standard at school and work. I have done draping as shown in video but typically only with very long time clients. I am so happy I found this course. It was by an actual sit in class getting canceled that I needed to search for another means of completing my CEUs. I was also able to receive my Reiki Master attunement as well because my schedule freed up due to the other course getting canceled. The Integrative Massage: Spirit course is so in synch with what I just accomplished in Reiki that I am overjoyed beyond words. Please continue to offer this course because more people need to learn this amazing way of healing. Excellent course Purchased the DVD - did the massage routine & then reviewed material a second time - effective way to solidify the information Nice to have the DVD and workbook as reference materials. Great review for what I had learned in school. I will definitely apply these techniques and practice with a friend so I can offer it as a specific modality for my clients. Your support staff was very friendly and helpful. 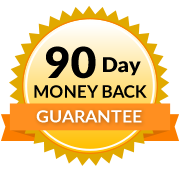 I will order more courses again in the near future and I will also tell fellow massage therapists about your CEU courses. Thank you! I really liked this course. It was a great refresher and a great way to use multiple massage modalities. I learned some new things and I got a better understanding of some other things I learned before. I really enjoyed this course and learned a lot about bringing my intention into my healing approach. The course was especially useful to me as it pertained to myofascial work. The leg and arm pulls are techniques that I have begun using in my massage. The lymphatic massage techniques were known to me but provided a good review. I also use some energy work but to a limited degree. It is important to stay focused and engaged when doing massage and the course also stressed this point. I am really happy I bought the Spirit Massage course, because I gained new knowledge. It was easy and interesting. The entire course was very helpful to me. I especially learned new ways to combine modalities and techniques from the variety of ways in this Integrative Massage: Spirit session. This was my third integrative massage course - and the one I enjoyed the most. This course was the most different from the massage I learned in school- combining energy work with more physical modalities. This is the kind of work I enjoy doing. So I really liked to see how someone else combined the modalities together. I have enjoyed all the courses I have taken from the Institute. Thank you! 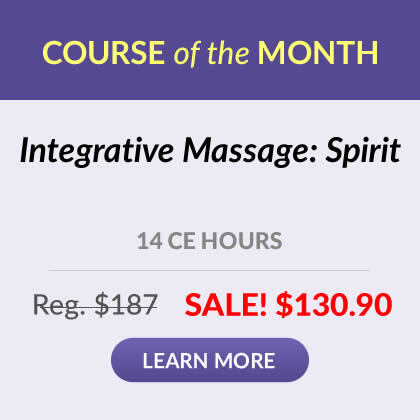 I ordered the Spirit Massage course because it was on sale, but was quickly blown away by how thorough the class was. The course information was detailed and technical while the massage routine was relaxing and peaceful. I have been a LMT for 9 years. This CEU class was well prepared, informative, enjoyable, and easy to understand. I will be highly recommending this class to colleagues as well as this institution as my phone call with customer service was exceptional. Thank you!! Explain the anatomy of the lymphatic system and its function in health and disease. Outline and discuss the types and causes of edema. Determine indications for lymphatic drainage massage and discuss benefits of each. Summarize and give examples of contraindications for MLD. Describe lymphatic massage techniques and demonstrate each. Define guided imagery and give examples of the benefits it has for health and well-being. Define energy channeling and discuss its effectiveness during massage therapy. List and give characteristics of each of the seven chakras and how chakra balancing benefits health and well-being. Identify the components of fascia and describe how these components create cross linkages in fascia. List and discuss 4 rules for performing Myofascial Release. Demonstrate a routine that utilizes Lymphatic Drainage, Guided Imagery, Energy Balancing, Myofascia Release and Swedish Massage specifically designed to quiet the mind and place the receiver in touch with the deeper rhythms. Give an intention for each technique used in this routine.